The Spectrum has standardized your refraction determination process to the very best available in the industry. We start by analzing your current Rx prescription with wavefront lensometry the EZ-200 that is placed into your examination record for comparison. The EZ-200 Advance Automatic Lens Analyzer is a sophisticated and easy-to-use spectacle measuring system. It can automatically read lens power (sphere, cylinder, axis), recognize and measure multifocals and progressives, display far and near point distance from optical center for progressive lenses, and measure monocular and total spectacle PD!on. We then utilize industry leading Wavefront Analyzer refraction technology to provide us the wavefront aberration, corneal topography and auto‐refraction at the time of your exam. This is all done with invisible light so that you experience no discomfort. Our system features full auto‐alignment, onboard evaluation software, wavefront image sequence and simulated visual acuity assessment to provide us with the best starting point on the day of your exam. The end result is networked into our exam which allows us all your information to provide the optimal refractive determination. 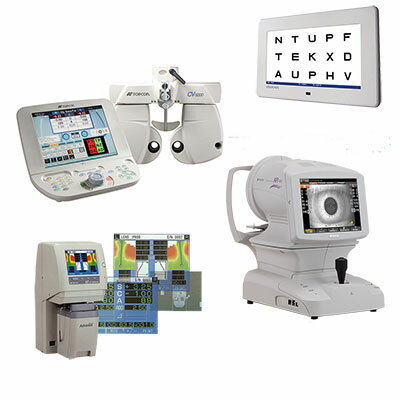 We employe the CV5000S in our exam room as our refraction systems. We found that patients had to work hard and rely on visual memory to work out when they are seeing better, when they are shown a unilinear sequence of options. With the CV-5000S, our patients can now simultaneously view more than one image and subsequently decide which is better by comparing them side-to-side. This reduces ocular stress and confusion many patients experienced. Your refractive data is be stored, shared and accessed more easily by all those involved in your eye care as this information is transferred to our Electronic Medical Records .